This is a unique 2 cabin 2 head owners layout. According to Jean Francois Fountaine, when this boat was manufactured in 1998, it is the finest and best equipped Bahia ever built. 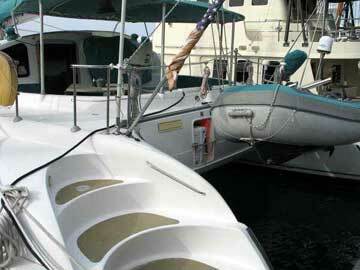 All installations and custom work was completed at the factory of Fountaine Pajot. This particular "dream boat" is the result of years of research and numerous trips to the factory to consult with naval architects and designers. The yacht crossed the Atlantic in the ARC race and placed third. The sellers are moving to land after years of navigating the Caribbean without incident. Age and health requires them to sell their beloved liveaboard. 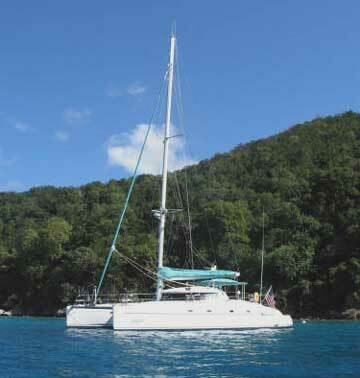 This is your chance to own the best equipped and maintained catamaran of it's size on the market. 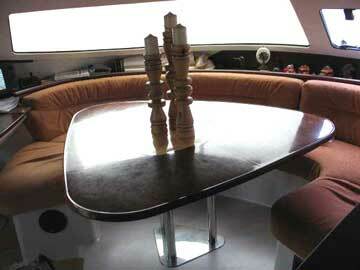 It is in excellent condition and ready for new owners to sail worldwide. 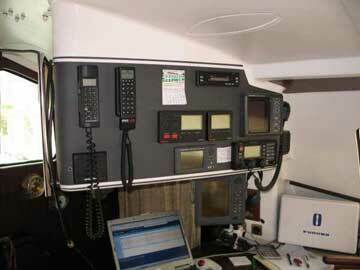 The navigation station is complete and upgraded with Furuno radar,GPS-32,fishfinder,1900C NavNet chartplotter with slave at helm and C-Map Electronic charts for entire Caribbean to NC,heading sensor. ICOM M802 SSB/HAM with AT140 auto tune,portable VHF. Autohelm ST7000,tridata,multi,wind with duplicate at cockpit. Shipmate VHF. Mini M sattelite phone with 2 lines, data,fax. Sailmail Pro email modem. Layout Port Side. Aft cabin with insuite shower and head. Forward of head is 4 drawer deep freeze,convection oven/broiler/microwave. Then a "wet room" for scuba gear. Forward is huge laundry with separate washer and dryer, pantry,work bench, box refrigerator. Layout Starboard Side. Huge aft berth,flatscreen LCD TV, DVD player, couch, large closets, office with fax,phone. Leading to separate head,lavatory,huge shower. Salon is large spacious and well appointed. Cabins have double thick custom mattresses.Heads & galley fixtures are 24k gold plate with inlayed lapic and onyx. Cockpit has custom teak enlayed folding table. Electrical system is 110v/220v installation with two battery chargers,Mastervolt Mass 12/400,Victron Energie 12v/1600watt invertor,Quay flexes. Kohler 8kw generator with "Quiet Package". CLD 24000 btu air conditioner. ACR IPERB #2742.Zodiac Life Raft.KISS wind generaror.9 12v Voyager deep cell batteries. Sails and Rigging-New 130% genoa on Profurl, full battened main,tridadial spinnaker with sock,3 electric and 5 manuel Lewmar winches. All top rigging was replaced and size increased in 2005.New bimini top,winch covers. Bauer 300 bar dive compressor. Caribe 12' RIB with Yamaha 9.9hp outboard. Other features: Additional mirrors in heads. Teak bar in salon,Mosquito screens,cockpit cushions and back rests,4 Plastimo Pilot II Co2 vests,throwable horseshoe type PFD,emergency tiller,65 lb.CQR on 215' chain,2 additional anchors, plus 500' of rode,extended variety of spare parts,new starter,alternator,pumps, etc.,colplete set of tools, filters,manuels, etc.,fire extinguishers,visual distress signals,sound device,fishing gear and kitchenware. Plumbing-Holding tank,safety packages,Aqua Set 200 lt/hour watermaker. Engine(s): 2 x Diesel Twin Yanmar #3JH3E. Port-2191 hrs. Starboard-2235 hrs. Oil/filter changed every 200 hrs. Yanmar SD 30 saildrives new in 2004. Cruise speed 6k@2500 rpm. Max 8k@3000 rpm. MaxProp folding props. Construction: 2 cabin/2 head, galley up, sloop rig, equipped for cruising, 1300 sgft. sail, 6'5" headroom. My boat has been sold. I had a back-up buyer from your website, but he had to sell some property in Seattle first and that was too late.